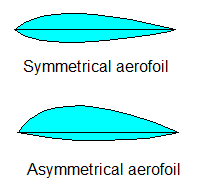 In the section Rotor Aerodynamics we considered the aerodynamic aspects of airfoils. We will, therefore, now look at several rotorblade designs. Probably the single most important rotor design parameter is its Lift/Drag ratio, which should be as high as possible. This ratio depends on the design of the aerofoil , and before we go on to discuss a number of types, we will first introduce the fineness ratio. This is the thickness of the airfoil as a percentage of the chord length. A blade with a good L/D performance has a fineness ratio of about 15%, with its maximum chamber being a quarter of the way back from the leading edge. A typical L/D value for a helicopter blade is 30:1. The types of aerofoils used with a rotorblade differ (figure below). For a long time, most of them were symmetrical. However, a higher L/D ratio is possible with non-symmetrical versions. Due to the greater internal forces occurring in these types of blades, they only came into existence when the appropriate composite materials were developed. These can cope with the high internal strain, while their weight is kept low. When a blade rotates, each point on it travels at a different speed. The further away from the root, the higher the velocity. This means that the contribution to lift and drag of every point on the blade differs, with each aspect getting larger when moving closer to the rotor tip. Clearly, the lift distribution over the blade is not constant. This is not a desirable situation, because the contribution diminishes when getting closer to the root. To change this distribution, blades are twisted and, sometimes, also tapered. The twist is such that the angle of attack increases when travelling towards the root, producing more lift. Tapering the blade also contributes to achieving a more evenly spaced lift distribution. With blade tapering, the blade's surface gets larger when travelling towards its root. Both tapering and twisting can be observed when looking carefully at rotorblades at rest. 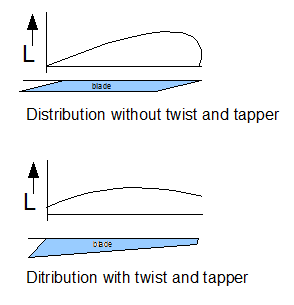 Note that blade tapering is not always used (especially on metal blades because of a more complicated fabrication process). Blade twist and taper leads to large angles of attack and large blade surfaces at the root. However, close to the root, the blade is travelling over the hull, so the generated downwash does not contribute to helicopter thrust. For this reason, rotorblades are often cut out near the root. Another reason for rotor blade cut out is to reduce the effects of potential reverse flow (on the retreating rotorblade) when flying at high speeds. Rotorblades are constantly strained by moments that try to twist them. This twisting has its origins in the moments which exist between the centre of pressure (due to the aerodynamic forces) and the mass centroid over the chord line. The blade designer must take these twisting moments into account by designing a blade with high torsional stiffness. He must also ensure that the mass centroid is located ahead of the centre of pressure for all blade angles (in its operational range). In this way, lift tends to lower the angle of attack: a stable condition. When the blades are very long or the helicopter is designed with a high rotor RPM, the blade tip speed can become extremely high. When the tip speed reaches the sound of speed, pressure waves come into existence, which causes rotor drag. A high tip speed is also the single most important design parameter influencing generated noise levels. It is, therefore, logical to expect more designs with lower RPM and very efficient (larger L/D ratio) performance blades. In this way, blade efficiency is traded off for noise reduction instead of better flight performance. Some important design requirements for blades are high torsional stiffness and a good L/D ratio. Note that the weight of the rotor also has important consequences for both the necessary engine power and stored kinethic energy (important for good auto-rotation performance). The early designs of rotorblades, which resemble early classic wing design, consisted of long steel tube spars, wooden ribs and some light surface material attached to them. From the 1960s onwards, all metal aluminium alloy blades were introduced. These were constructed from long hollow leading edge D-spar extrusions, allied with some light (probably aluminium) trailing edge constructions. The use of extrusions made blade taper difficult to produce. Honeycomb constructions were added to achieve a stiff and light construction. These days, composite materials like fibreglass and carbon fibre are used for the fabrication of rotorblades. Stainless steel leading edge spars are also used, and all composite spar designs exist too. The fatigue life properties of composite materials are far better than those of metals. Fibreglass is used for its strength and chemical inertness. Carbon fibre layers, sandwiched at right angles, are used to add stiffness. A sample design might look like the figure below. 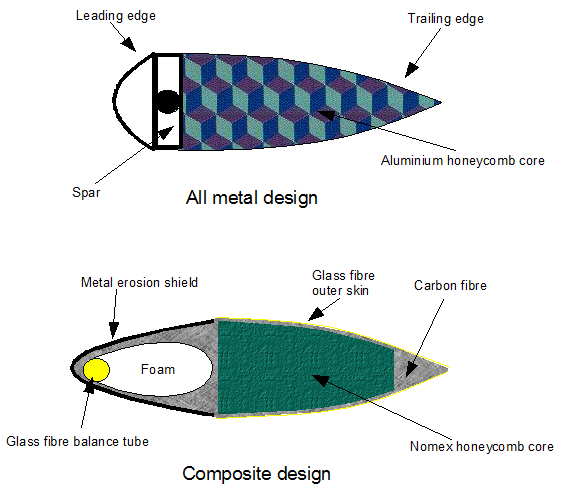 Generally, composite blades also have some extra added weight (for example, at the blade's tip) in order to achieve desirable inertial characteristics. At the leading edge, an (often metal) erosion shield is used. When using modern composite materials, lightning strikes have to be considered because these are more dangerous to composite constructions. This is because of the much greater electrical resistance of composite materials compared to all metal blades. A lightning strike on composite materials produces a lot of heat along the current’s path, which can damage the blade significantly. In order to provide a low resistance electrical path, the solution is to have an outside skin that possesses low electrical resistance and connects all of the rotor segments. As an alternative approach, engineers may wish to consider trying the VABS software for modeling very complex composite rotor blades. Developed at Georgia Tech and Utah State University, VABS is capable of quickly and rigorously decoupling an original 3D slender solid with complex microstructure (sophisticated cross-section with or without spanwise heterogeneity) into a simple engineering beam model. VABS (Variational Asymptotical Beam Sectional Analysis), is a unique tool capable of realistic modeling of initially curved and twisted anisotropic beams with arbitrary sectional topology and materials. Evaluation licenses of VABS are available through AnalySwift. What are the dimensions of the rotor blade airfoil? Could a rotor that has a profile that is optimized for the speed of each location of the rotor be an advantage. Example, towards the root the blade would have a longer cord and is so doing the length of the rotor would be reduced making it more of a short aspect ratio vehicle? Is there any 'blade twist" built into the main rotor blades used on Sikorsky S-61(UH-3H) helicopters? Ok guys I found the Sikorsky UH-3H blade "spar" twist information. 5 degrees 58 mins at 40 inches from the root and it continues through to the tip cap. thank you for letting me post the question anyway. Hi, I'm relatively new to the topic of helicopter design, and this page has been of great help. I have a doubt though. Is it possible that the aerofoil shape of the blade changes from root to tip? 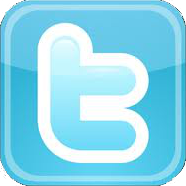 For example, at the root, the profile has a NACA 0012, while at the tip its a different profile. If it is possible, can someone explain why do we design it that way?